Note: You don't have to understand layersan advanced Elements feature that lets you slice up your image into stackable componentsto use the Free Rotate Layer command. See the tutorial within Elements (Help ^^ Tutorials ~^ Using Layers) or Photoshop Elements: The Missing Manual for more on how Layers work. Figure 10-6. 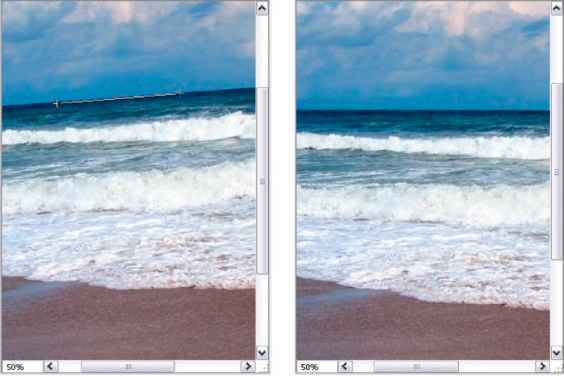 Left: To correct the crooked horizon in this photo, just draw a line along the part that should be level. It's easiest to do this by choosing a clearly marked area like the horizon in this photo. 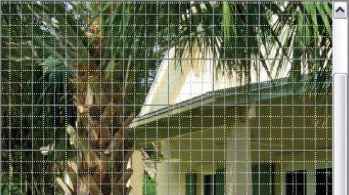 But you could also draw a line across the middle of a lawn, for instance, and Elements would straighten the photo to that line. Right: Elements automatically rotates the photo to straighten its contents. As shown here, you see the results of selecting "Grow Canvas to Fit," which automatically trims off the ragged edges of your straightened photo. If you aren't sure where straight is, Elements gives you some help figuring it out, as shown in Figure 10-7 .